Elena Degtyareva is a Skype Master Teacher from Verkhoturye, Russia, a small town with many young students eager to learn about the world. Elena has pioneered the use of Skype in her education community, taking students on virtual trips to distant, exciting places. So far, the students have Skyped with classrooms in Vietnam, Morocco, Ukraine, Kazakhstan, Belarus, Egypt, and Africa. They have even exchanged traditional dance lessons with students in India, explored a zoo in Lisbon, Portugal, and learned about fire safety from a Dalmation and his firefighter based in Arkansas, U.S.A.
Elena’s students have taken global peers on tours of their local museum and shared lessons on history, such as the Russian Revolution and Tsar Nicholas II. “We’re very proud of our town and homeland,” Elena said. What sparked Elena’s passion for using Skype to broaden her students’ horizons? A tech enthusiast, she belongs to the Microsoft Innovative Educator program, which provided her with the training resources to earn her Skype Master Teacher badge. Through the program, she met a mentor and other teachers around the world who were also interested in using technology to enrich student learning. 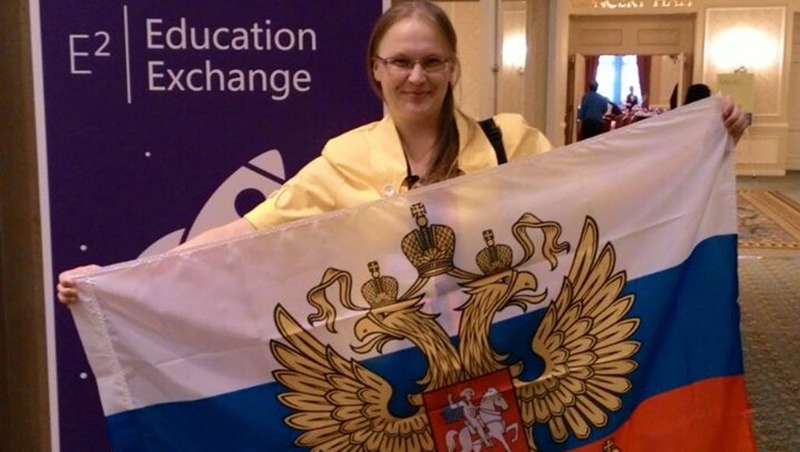 Elena herself uses Skype to stay in touch with a community of more than 200 teachers across Russia who chat with one another and share tips for enhancing lessons with technology. “Some teachers are afraid and think using Skype will be too difficult,” she said. “I tell them to just try it — it’s so easy.” Elena has created her own webinars to help teachers who want to get started using Skype and other tech tools in the classroom. Skype’s handy recording function makes it easy to record her webinars and post them online. Elena’s enthusiasm for tech has transferred to her pupils as well. “We use all the tools — Skype, OneNote, Sway, and Minecraft. The students love Minecraft, and my new course on ComputerCraft,” Elena said.